So, yesterday I spent my day weaving in the 120+ ends on Bacon Blanket 2.0, and I was all set to begin the border, when we got a surprise. Mims lost her first tooth! I lost my first tooth when I was about her age, and I remember it vividly because my mom made such a wonderful big deal out of it. She spent the day making me a tooth pillow, and talking about the tooth fairy, and making me feel so special because I was growing up. At first, that tooth pillow was merely a conduit that the tooth fairy and I used to exchange goods, but after a few teeth, it became a place for me to leave notes and tooth-related questions for my tooth fairy. "Margaret" always responded to those letters with a tiny letter of her own, in the tiniest handwriting I had ever seen. 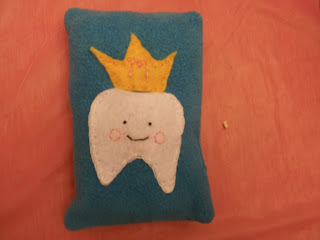 So, in awesome Eads tradition, I spent last night working on Mims's very own tooth pillow. This is what I came up with for her. She graciously allowed me to shoot a picture of it, next to her tiny tooth, informing me that "Once the tooth fairy takes it, Mommy, it's gone for good." She and I carefully put it under her pillow, and despite my concern that we might be creating a Princess and the Pea situation, she was able to go to sleep. Lo and behold, this morning we discovered that the tooth fairy had come and collected her tooth. She left Mims some money and a note. She was elated, running around upstairs, showing her dad and me the note, asking us to read it over and over. And I wasn't surprised at all that it was in the tiniest handwriting she had ever seen.